If you are searching for the best roofing company Rockwall tx has to offer, then you have come to the right place. Mason Roofing provides timely, and excellent service, that will leave you with a smile on your face. If you have had, or think you may have had roof damage, or any other damage to your home during the storm season, give us a call. we will come out and give you a free assessment. If we find that you have had hail damage, or any other damage to your roof or home, we will provide a free estimate that you can take to your insurance company. Once they have determined how much they will pay toward the cost of repair, we will take it from there. One of the reasons people call us when they are in need of a roofing contractor in Rockwall Tx or surrounding areas is that we take on the whole job so that you don't have to worry about all the details. For example, if we find other damage to your home other than your roof, we will take care of contracting the labor so that you don't have spend time calling contractors and dealing with the headaches of getting the work done. let us handle all of that for you. You have enough to do without having to work out all of those details that can be stressful when you don't have all of the connections that we have. We will get your home back to it's beautiful state as quickly as is humanly possible. Give us a call and let us get you on your way to a better roof. 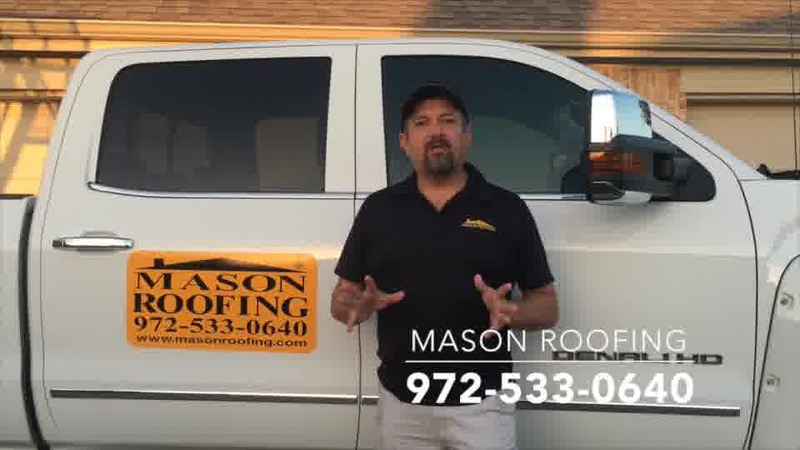 If you think you may have roof damage and want to take a look for yourself before you give us a call, then watch the video. Paul mason tells you how to check for roof damage in just a few easy steps. Let us prove that we are the best roofing company Rockwall Tx has to offer for all of your roofing needs. give us a call today!